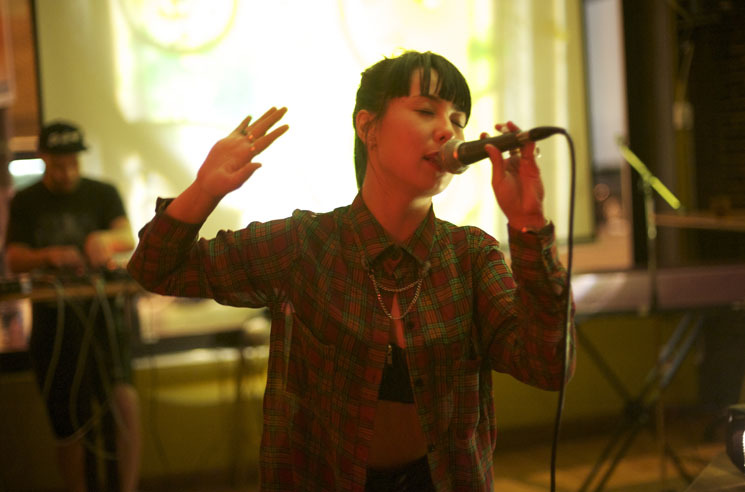 Hua Li 化力 — the alter-ego of Montreal-based multi-disciplinary artist Peggy Hogan — is a performer who commands attention. Taking to a makeshift stage in front of a modestly sized crowd at Maison Sociale late Friday night, Li straddled the line between hard-hitting rap bravado and Erykah Badu-esque neo-soul. It's a combination that might not sound great in theory, but works wonderfully in practice. Adding an ethereal, colourful element to Li's set was local artist Ariana Molly, who used water, ink and an old-school projector to create impressive DIY visuals. The bar-turned-temporary venue could have benefitted from a more inclusive, less awkward setup, but Li nonetheless worked the space as best she could. Never losing her high-energy charm, despite a crowd that remained tired and almost entirely unresponsive, she delivered tracks off her latest release Za Zhang and established herself an artist you should definitely keep your eye on.